While I was at a conference in California last week, a colleague presented a paper on the dangers of resting after an injury. She reported that one of the worst things you can do after being hurt is to stop moving. It is something I’ve written about many times (here, here and here.) However, my colleague’s paper discussed new research on why motion is so important after an injury. Do not move so much that it hurts. Movement is essential. And pain is an important warning indicator. Do not move enough to cause pain. Move in very small ways. If small motion causes pain, try passive motion. An example of passive motion is when you relax your ankle and then use your hands to gently move your foot up and down and side to side. You can have a friend or family member move the injured body part if it is too hard for you to do yourself. Motion is important. But so is listening to pain! Scar tissue builds up in joints that are not moving. Research has shown that when you do not move, scar tissue is created in your joints. This is why people report stiffness in their joints after long periods of immobility, such as bedrest or wearing a cast. Your joint won’t know how to repair if your body is not constantly reminded of what kind of movement you do with that joint. Without some movement, scar tissue will randomly lay down in all directions, instead of lining up the way you need it to. 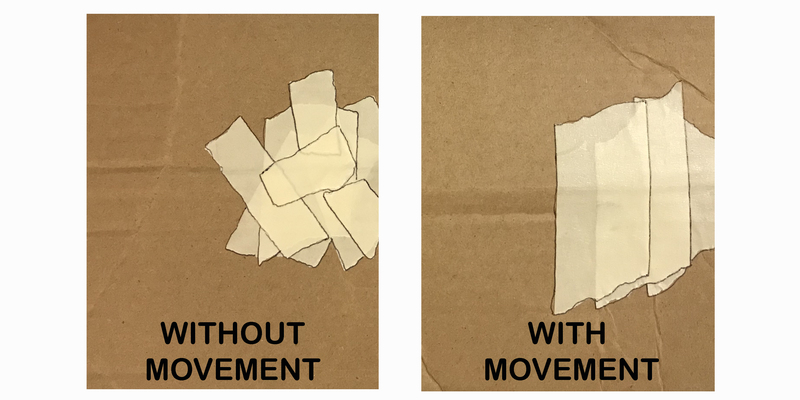 As you can see in the pictures above and in the video, the tape lined up properly will allow for more motion than the tape that is randomly placed in all different directions. Without motion, your body will create scar tissue randomly. With motion, scar tissue is created in lines that allow for movement. Joints that aren’t moving do not get enough water or other fluids necessary for proper healing. Research has shown that healing fluid flows into joints with motion. Without motion, the joints get dry. This leads to stiffness and increased scar tissue. “Breaking up scar tissue” after the injury has healed will result in jagged edges. Some doctors recommend waiting for scar tissue to be created and then breaking it up. The problem with this is that broken scar tissue has jagged edges. If you continue to move during healing, your body will create scar tissue in smooth lines. Laying down the scar tissue the right way the first time will result in smoother and cleaner edges than laying it down randomly and then breaking it up later. Plus breaking up scar tissue is painful! Chiropractic treatment helps joints move better. If you are injured, call us to get adjusted as soon as you can! Even if your joint feels too swollen and painful to move, we can help you start healing. Call us at 847-869-1313 to schedule your appointment and prevent stiffness in your joints.